The furnishing of the space, designed by the Stabili Architetti studio, was entirely built by TM Italia. The project was based on concept D90 for the doors and concept T45 for the lower base units. 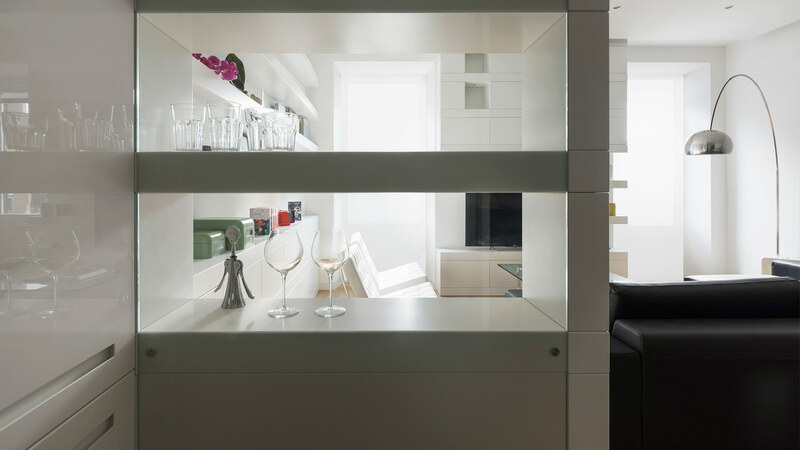 The set of materials includes finishes in lacquered matt white and extra-clear tempered glass, in order to give a sense of space to this prestigious, small apartment with studiously optimised dimensions. 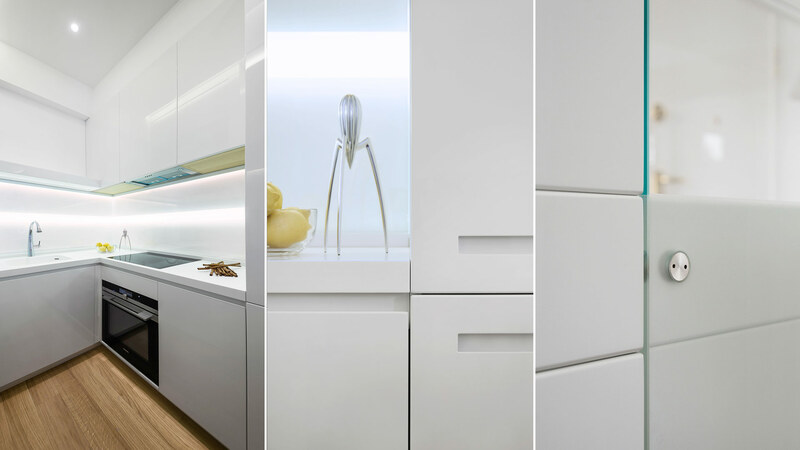 Besides the aesthetic continuity of the materials used for all the furnishings, the project features consistency in its dimensions and design: the decorative unit heights vary in sequence by 33 cm and 10 cm. 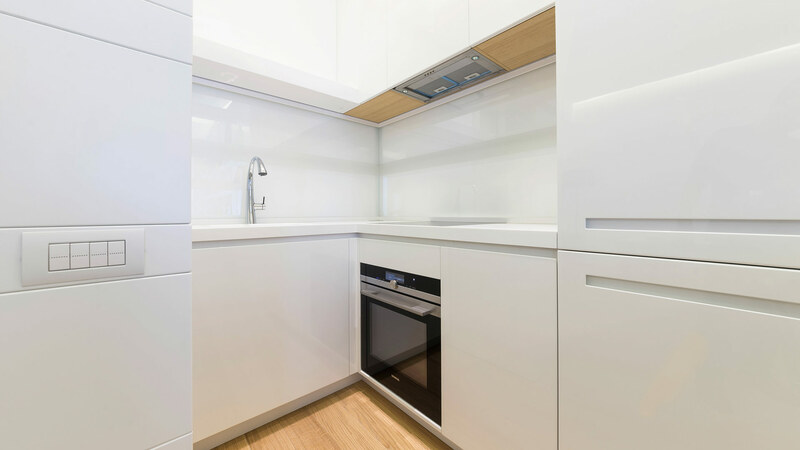 Inside the open space, the kitchen area is created by a range of custom-made units made of white lacquered wood and extra-clear tempered glass surfaces. 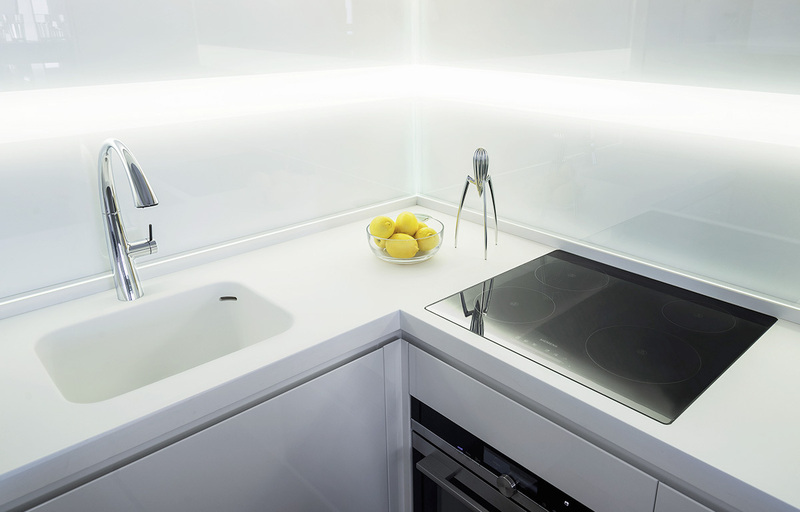 The L-shaped kitchen has lacquered matt white finishes and a Corian top housing a sink and welded on site. The top is equipped with a retractable electrified column for small appliances. 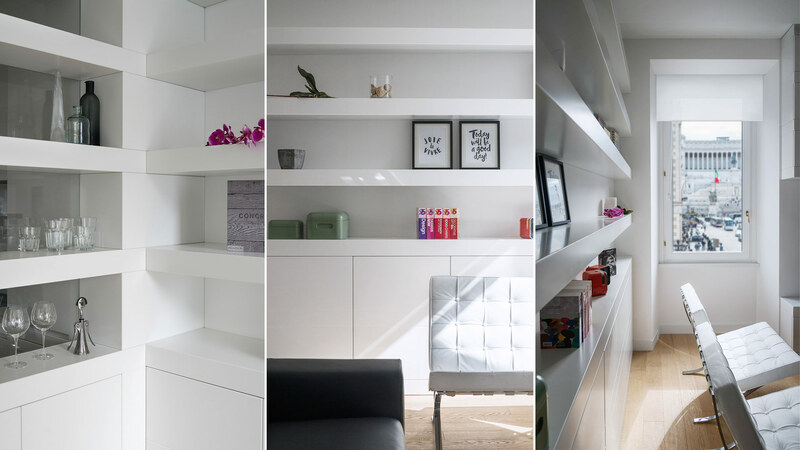 The shelving inside the units house a crepuscular mechanism that turns on the LED lighting when it detects a presence. A furniture composition was built in the living area, located between the two windows overlooking the Altar of the Homeland, with a low cabinet and suspended lacquered units equipped with internal LED spot lights. The components in the living area have a customised structure, with trapezoidal shapes that compensate the irregularities of the walls and restore the orthogonal design of the space. The customised panelling in the hallway provides aesthetic continuity with the furniture and allows access to electrical panels. 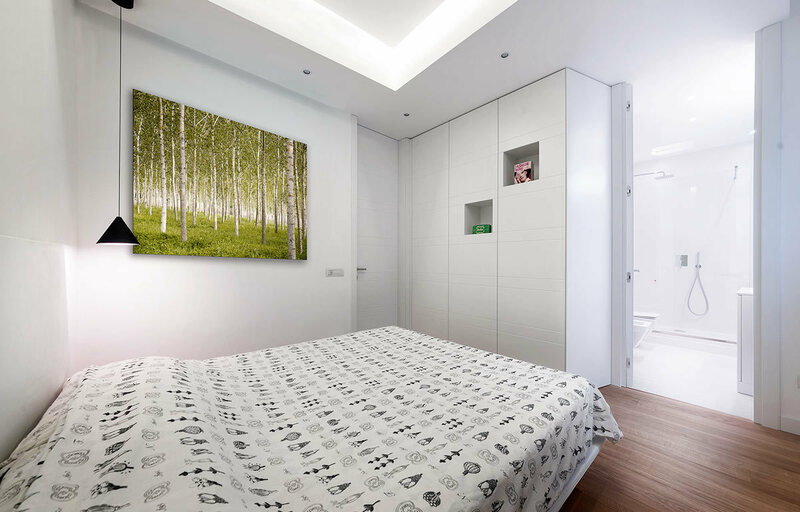 The cupboards in the bedroom recall the finishes and decorative units in the other environments. The doors are also made by TM Italia using the same finishes and the same design as the rest of the interior design project, with customised opening mechanisms and sound-absorption systems. The project includes a utility bathroom with access from the bedroom and a master bathroom with access from the living area. 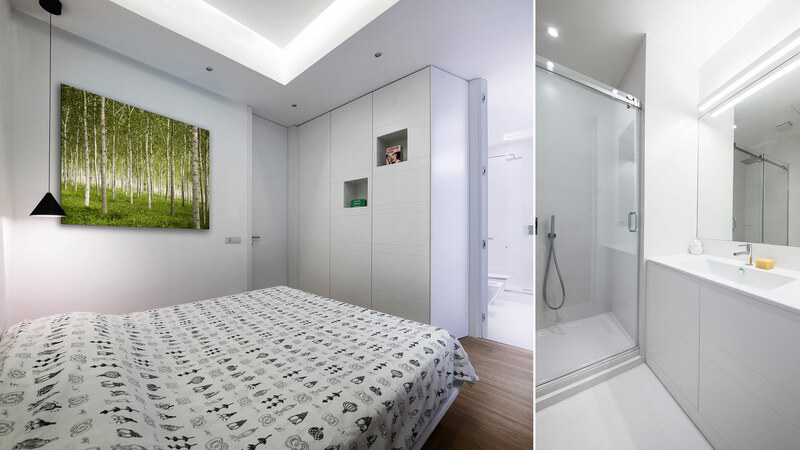 Both have customised furnishings with push-and-pull doors and stylistic continuity with the rest of the space.